Objective: To practice modal verbs, simple past and present perfect. Materials: Masking tape; a plastic knife, ketchup, a crumpled piece of paper; an imitation of an ID card; a piece of rope; any other piece of evidence you can think of. 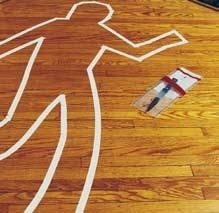 Before class time, use masking tape to draw the outline of a body on the floor, like the one in the illustration above. Place pieces of evidence around the classroom: the plastic knife stained with ketchup on the window sill; the photo ID in the garbage can; a piece of rope tied to the window latch; a crumpled note ("You will be the next!") under the table or one of the desks, etc. Why was the person murdered? When students arrive, tell them there has been a crime in the classroom, and they will be the detectives. In pairs or small groups, they look around to find the evidence and make guesses about what happened. Instruct them to use modals of speculation and the verb tenses mentioned above. This activity was suggested by Bruno Cavalcanti Albuquerque, a talented young teacher at Casa Thomas Jefferson - Brasília, Brazil. We would like to thank Bruno for sharing his creativity with us.